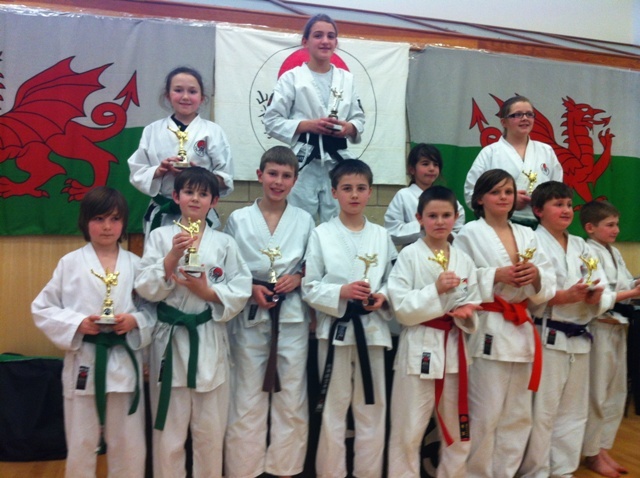 On Saturday 3rd March 2012 the CSKA took a squad of members to the Yamabushi Invitational Karate Competition which was held in Wrexham. The event started at 10:00 with the children’s kata and progressed throughout the day ending with men’s kumite. Throughout the day there were some excellent displays of kata and kumite which have all been developed during training. The instructors at the CSKA would like to congratulate all participants for the effort they put in. Emma Evans – left with a huge trophy haul having been placed in the top three in every event she entered. She was also awarded ‘Female Junior Grand Champion’. Megan Wake – This was Megan’s first outing for the CSKA and it is hoped she will be taking part in many more to come……. as she took first and fourth place. Morgan Sterio – a well deserved fourth place in kata and fourth place in kumite. Roan Jones – A fantastic display showing off some excellently timed kicks and punches. 1st place in kumite in what was his first ever competition. He also went on to take ‘Junior Male Grand Champion’. Well Done Roan!! The men’s kata was the first time that some of the seniors had competed. Terry Lawler, Noel Clarke, Giles Warburton & Egidijus (Iggy) Ziaukas were showing off their skills for the very first time. They managed to surprise even themselves with the CSKA taking 2nd (Tom Heggie) and 3rd (Iggy Ziaukas) place. A massive well done to all. The men’s kumite….. This was always going to be a challenging event and it didn’t disappoint. The first fight saw Iggy Ziaukas (Red belt) up against Yamabushi’s Daniel Nottage (black belt). This resulted in a fantastic first bout which set the standard for the rest of the event. Iggy progressing through all of the rounds eventually losing in the final to CSKA’s Tom Heggie. Giles Warburton (green belt) made his debut kumite appearance and his first fight was against Yamabushi’s Chris Edwards (black belt). Another brilliant display of technique and accuracy meant Giles took the match. He also progressed through all of the rounds, but he was also eventually stopped by Tom Heggie. Giles then went on to fight for third and fourth place where he faced Terry Lawler. The final result: Giles 3rd and Terry 4th. Well done both!! Noel Clarke was also making his debut appearance but unfortunately was defeated at the first hurdle by Giles Warburton. Although defeated he didn’t go down without a fight. He managed to put on a show for all scoring the first of the points making it a close bout and an excellent start to his competition career. The final results for the men’s kumite saw the CSKA taking 1st (Tom Heggie), 2nd (Iggy Ziaukas) , 3rd (Giles Warburton) and 4th (Terry Lawler) place. The CSKA junior kata team (Emma Evans, Callum Porter & Alex Hill) took first place in the junior event and then went on to take fourth place in the cadet level where the CSKA cadet team (Jai York, Will Oakland & Frankie) took second. A massive thanks to all of the instructors that both took the time to referee and arrange the competition and also get the competitors ready in the weeks leading up to the event. Details of the return competition to be held at Hawarden later on in the year will be provided when confirmed. If anyone has any photo’s or video’s of the event that they would like adding to the website, please see Stu Needham. 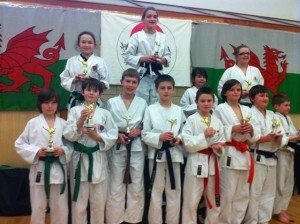 Emma, Alex and Callum also took 2nd in the team kumite, earning medals. Huge thanks to all involved in organising this event, it was a very long day for you all. Thank you for giving up your Saturday to allow our ‘kids’ the opportunity to compete. Well done Hawarden and Llanbedr clubs, good to see so many of you on the podium. Selby dojo was pleased with their results. Though we only had six entries they all enjoyed it and Frankie Sherman was proud to take part and contibute to a joint club Hawarden and Selby gold and silver medal for team kumite and kata see u all soon selby dojo.